Camera system for the ultimate narcissist? 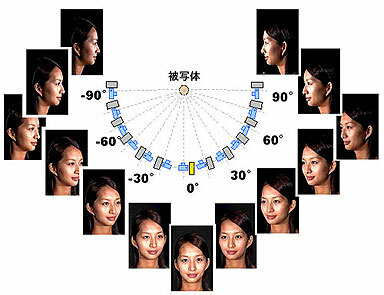 Cosmetics giant Kao has developed a "multi-perspective image analysis system" that captures facial images from a variety of angles and under various lighting conditions, for the purpose of analyzing skin characteristics such as tone and sheen. The system's ability to perform detailed analysis of make-up finish means it will likely play a role in cosmetic product development. 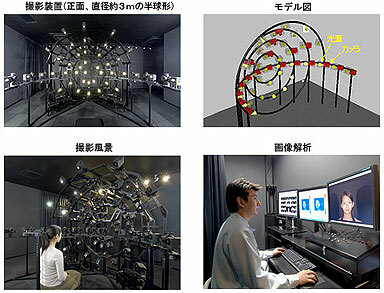 At 3 meters (10 feet) in diameter, the semi-spherical apparatus consists of 20 cameras and 50 lights, enabling users to observe subtle changes in how the skin looks under a wide range of indoor and outdoor lighting conditions. In addition to the frontal view that you see in the mirror, the system records lateral and diagonal images, allowing you to check how the face appears to others. Make-up finish and the beauty of bare skin can be quantitatively analyzed. Kao says the system was used in the development of its new foundation, Sofina Raycious Perfect Angle Powder, which went on sale at the end of February.